Many of our properties are available for longer periods during the off season and they are no less spectacular than during the warmer months. Some rates are negotiable, please don't hesitate to ask. Harrington Cove Cottage, Spruce Head/St. 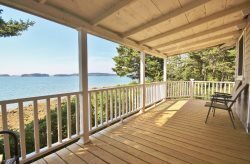 George: Stunning and private waterfront home with 2 bedrooms and 1 bath waterfront. Fully and tastefully furnished with fireplace and whole-home generator. Photos available, please inquire. Unfurnished. Year Round Lease Required. 2 Bedroom, 1+ Bathroom. Ash Point Cottage located in idyllic Owls Head, sits on a small hill overlooking Ash Island and the Muscle Ridge Channel.Recently painted and recapeted. Quaint, sunny and neat, the cottage is simple, comfortable and unfussy. It is an ideal place for a couple or a small family. The house is one floor with a two bedrooms, one full bath, a living room, eat-in kitchen and a fantastic three season room with views of the water. There is a large lawn surrounding the house with mature trees as well. The bathroom has a tub shower combination and is located in the hallway between the two bedrooms. The view through the living room bay window is lovely. The house is ready for cable service. The kitchen is fully equipped with all appliances,the dining area can seat four comfortably. The three season room, which also have views of the water, has a hook up for cable-connected television. This is a fantastic room to read in, have coffee in the morning or enjoy a breeze right off the ocean. Ash Point Cottage is very close to Rockland, Camden and the St. George Peninsula. Beaches, shopping, restaurants, galleries, etc. are within a 10 minute drive. $1800/month plus Utilities, Lawn, Trash & Plowing. Year Lease required.